Waves three to four times higher than normal arrived along San Diego's coast Wednesday, fueled by Hurricane Marie churning in the Pacific Ocean. At Imperial Beach, Maritza Bennett took one look at the 10-foot surf and decided she wouldn't be wading into the waves. “I don’t know how to swim so I don’t want to take the risk,” Bennett said. The Category 5 storm has weakened to a Category 2 but produced above normal tides to beaches from San Diego to Santa Barbara through Friday. The swell produced flooding in Long Beach and Seal Beach to the north and brought thousands of people to the water's edge at the famous Wedge surf spot in Newport Beach where waves were described as epic. Conditions along San Diego's coastline will peak Wednesday. The highest surf will be along the south facing beaches including: Coronado, OB, Mission, Blacks, the Wedge, and Oceanside, according to San Diego lifeguards. At Imperial Beach fisherman David Renteria wasn't even sure if he wanted to chance trying to cast into the surf. “Looks like the waves are a little too big to even throw a line out there,” he said. 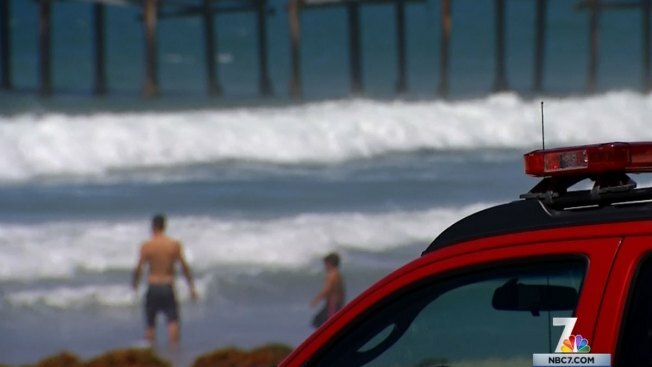 San Diego lifeguards, at full staff through Labor Day, warned swimmers and surfers that there may be dangerously strong currents along with the high surf. For those who simply want to get a view from the shore - say at Swami's or Blacks - steer clear of the rocks and jetties. So-called "sneaker" waves can arrive without notice. "You can have a 9 or 10 footer out of the blue," Kodesh warned. "It can be dangerous." A high surf advisory was in effect for Orange County with 8 to 10 foot sets expected and 12 to 15 foot sets at south and southeast-facing beaches. Some of the hardest hit areas may include the Palos Verdes Peninsula, Point Mugu and Port Hueneme. Crowds gather at The Wedge in Newport Beach. Several homes and garages were flooded in Seal Beach after water cleared a 2 1/2 foot wall along several blocks of an oceanfront street, said police Sgt. John Scott. 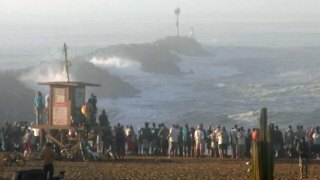 Wednesday morning, some waves at the Wedge were estimated to be at least 25 feet, more than double the usual wave size there, according to published reports. Thousands lined the beach on Tuesday to watch bodysurfers get pounded by storm-driven waves. Every morning, NBC 7 Meteorologist Jodi Kodesh checks wave heights through data collected on buoys along our coast. “When I came in this morning, I saw seven, eight, nine and Imperial Beach at 10,” she said. “That’s about three to four times our normal waves." At Bird's Surf Shed on Tuesday, surfers were talking about the conditions. There's no doubt there will be lots of surfers in the water trying to take advantage of the swell - experienced and beginners alike. Everyone has to watch out for each other because the conditions may be extremely dangerous, Bird said. Last weekend, there were 197 rescues, which is average, said Sgt. Bill Bender. Even if beachgoers are in an area monitored by a lifeguard, Kodesh said they should still be on alert. "San Diego may experience flash rip currents where they move in faster versus a slow build," she said.